HOLLYWOOD, Calif. – Author Tom Clancy’s renowned CIA analyst returns this August when the new series “Tom Clancy’s Jack Ryan” debuts on Amazon. In anticipation, fans can catch up on all of the celebrated character’s cinematic exploits when a new 4K Ultra HD/Blu-ray Combo Collection arrives on August 21, 2018 from Paramount Home Media Distribution. In The Hunt For Red October, the USSR's best captain (Sean Connery) heads for the U.S. in a technologically advanced submarine. While the American government thinks it’s an attack, a lone CIA analyst (Alec Baldwin) insists the captain is planning to defect. 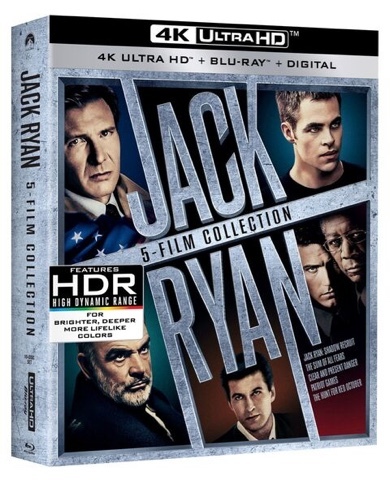 Both the 4K Ultra HD and Blu-ray Discs include commentary by director John McTiernan and the Blu-ray additionally includes a 29-minute behind-the-scenes look at the film.